Dr. Mehl specializes in Colonial Latin America, particularly colonial Mexico and the Spanish Philippines. Her main academic interests revolve around trans-oceanic and trans-regional perspectives, such as the connections that linked the Spanish American colonies and Southeast Asia during the colonial period. 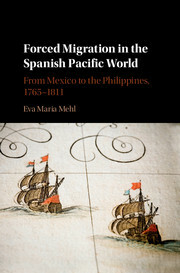 Her book, Forced Migration in the Spanish Pacific World: From Mexico to the Philippines, 1765-1811 (Cambridge University Press, 2016) analyzes the process of convict transportation and military recruitment in the Spanish Pacific during the time of the Bourbon reforms. Dr. Mehl has also published monographs in Spanish on the Jesuit missionary work in China during the early modern period and the expulsion of the Society of Jesus from Mexico in 1767. Forced Migration in the Spanish Pacific World: From Mexico to the Philippines, 1765-1811 (Cambridge University Press, 2016). "Mexican Recruits and Vagrants in Late Eighteenth-Century Philippines: Empire, Social Order, and Bourbon Reforms in the Spanish Pacific World." Hispanic American Historical Review 94, no. 4 (2014): 547-57. Expulsión y exilio de la Provincia Jesuita Mexicana, 1767-1820. Publicaciones Universidad de Alicante, 2006. Flagelum Iesuitarum. La Polémica Sobre los Jesuitas en México, 1754-1767. Publicaciones Universidad de Alicante, 2004. Dios y Belial en un Mismo Altar. Los Ritos Chinos y Malabares en la Extinción de la Compañía de Jesús. Publicaciones Universidad de Alicante, 2000.